Description: Splitting the signals at S. Rupert. Description: The Sun briefly lit up the train through a "sucker hole" for this shot! Description: Q140 makes the turn from the West and heads North through Greenwich. Description: CSX K-295 Southbound crossing the Iona Island causeway along the scenic Hudson River with backdrop of the Bear Mountain Bridge. Description: Q427 is making track speed up Washington Hill with about 30 cars in tow at 1:40. Description: CSX 4818 and 4747 are moving right along with a short Q427. Description: Q436 comes by Hinsdale center with a cut of stacks on the head end. 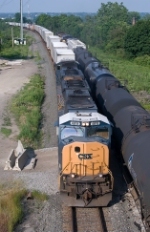 Description: An SD70MAC leads a SB manifest through Doswell. Description: CSX Q10914 heads west. Title: Eastbound at "Salt City"
Description: Q174 comes through the "sag" just west of William's Riding Way in Westfield at 8:20. Description: Q174 comes over Williams Riding Way at 8:20. The spur to "Salt City" is at right. Description: CSX Q117-30 passes E943, waiting to pull a string of epmties out from the Eastlake power plant. Description: CSX Q117-30 rolls through the high and wide detector at Eastlake OH. Description: Q702 strolls into Philly behind an AC60/70MAC duo. Description: Q11411 heads east after a delay in the Buff. Melting snow has refrozen on the limbs as the sun peeps out on an otherwise cloudy afternoon. Description: Camp Meeting Ave., 1742 hours. Description: This eastbound mixed freight heads eastbound before the NJT rush begins. Description: This sleepy village is an excellent location to view "A" Line trains from both directions.